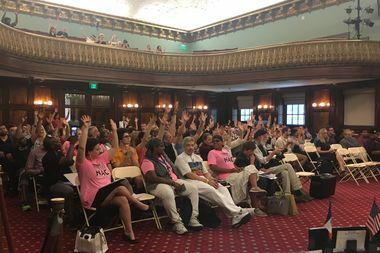 At a hearing Monday, those gathered to push city to repeal the Cabaret Law used jazz hands to support a speaker, as applause is not allowed in the City Council. CITY HALL — The city is digging in its heels on a reform bill that would overturn what has been called a "racist" and "absurdly outdated" law that makes dancing in bars illegal without a special license. Although the city has not issued a single citation for a violation of the Cabaret Law since 2016 according to data obtained by DNAinfo, the Law Department continues to fight a 2014 lawsuit filed by a Williamsburg venue owner who claims the law violates his patrons' First Amendment rights. "If Mayor de Blasio really wanted to move forward into the 21st century he ought to come out vocally against [the Cabaret Law]," said Andrew Muchmore, owner of Muchmore's in Williamsburg who filed the 2014 lawsuit against the city after his venue was issued a violation when patrons were swaying at a rock concert. Instead, Mayor Bill de Blasio's administration is continuing to fight the lawsuit in court, according to Lindsay Greene, a Senior Policy Advisor for Deputy Mayor Alicia Glen, who testified at a City Council hearing about the law on Monday but refused to give specifics about law enforcement. "What we heard up there was bunch of non-answers from the city," Muchmore said. "They're using the lawsuit as an excuse not to say anything." Greene told councilmembers gathered Monday that "there is some enforcement of the Cabaret Law" — which has been on the books since 1926 when it was introduced to curtail interracial mingling in Harlem Jazz clubs — but wouldn't give specifics, citing the pending lawsuit. "Our perspective in our internal conversation is trying to understand how best to support nightlife in all forms in the context of how it currently exists," she said. City Councilman Stephen Levin called the law and the reality "out of whack" and pressed Greene to define the city's stance on it. "Does this administration have a legal issue with the fact that hundreds of thousands are actually not abiding by the Cabaret law?" he asked. "Again that goes to the heart of the pending lawsuit and I cannot comment on the specifics," Greene replied. Levin asked if the city is actively fighting the lawsuit and wondered, if the city didn't agree with the Cabaret Law, why it won't move to settle the suit. "The administration is currently defending it," Greene said. Opponents to the prohibition-era law — part of a growing movement against it centered around North Brooklyn venues, musicians and artists — say the law has a racist history and should be nixed from the city's books for good. They say that the city can use it to unfairly target venues at the whims of local authorities. Councilman Rafael Espinal has pledged to draft a bill have it overturned. Advocates and attorney say the law is needlessly complicated and expensive process that's prohibitive for many small venues and doesn't relate to safety concerns which are already covered by FDNY, Department of Buildings and State Liquor Authority code compliance. "You can throw tons of money at highly trained experts [in order to secure a license], but because of Department of Consumer Affairs and [Department of Buildings], you'll be set back," said Arigilio Rodriguez, an attorney who specializes in State Liquor Law, and says the licenses he has secured often take more than two years to get. "It's not even about the safety issues." There are currently only 99 places in New York City you're legally allowed to dance in and another 28 locations have pending applications. And while the city is dragging its heels in defense of the Cabaret License in the court case, it hasn't actually been issuing violations to establishments for not having the permit, according to the Department of Consumer Affairs. According to DCA spokeswoman Christine Gianakis, the city hasn't issued a single violation for dancing without a license in violation of the cabaret law is a local New York City law, between Jan. 1 of 2016 and April 1 of 2017. Instead the State Liquor Authority, which enforces local laws, has been doing the brunt of enforcement action against errant dancers. Thirty-six New York City bars and restaurants forked over around $40,000 in fines to the state for allowing patrons to dance without a cabaret license between January of 2016 and April of 2017. Fines for the violation vary in price depending on how often an establishment is cited but they start at $1,000. Those bars restaurants who paid fines were spread out across the city, with concentrations in Lower Manhattan, Jackson Heights and Corona and Ozone Park, according to data obtained from the State Liquor Authority. Many of the businesses who paid the fines have since closed. These are the businesses that paid fines to the state for allowing dancing without a cabaret license since Jan. 1, 2016. A number of other venues were hit with fines thought they were later dismissed. Following the hearing, Councilman Levin said he would join Councilman Espinal to repeal the Cabaret Law he called "absurdly outdated." "There's laws that have a history of racism and homophobia," Levin said. "Those laws shouldn't be on the books. It's 2017." "They probably shouldn't be defending the law," Levin said. With additional reporting by Zoe Zeltner.